Keep Your Munchkin’s Toes Feeling Oh-So-Comfortable With These Cute Socks For Babies: Complete your little one's outfit with these cute baby socks that feature vibrant hues for versatility and soft fabric for comfort. 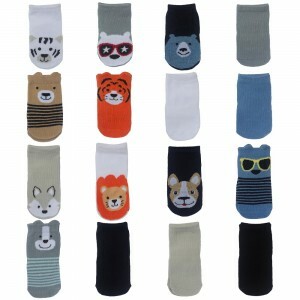 Incredible Quality: Made from soft and high-quality fabric, the warm baby socks are specially designed for longevity. The blend of excellent materials makes the fun baby socks a perfect pick for casual wear. Unique & Casual Design: The cool baby socks feature a casual hue that makes these socks ideal for daily wear. The sock set comes in an ankle length style that can be paired with every little outfit. Premium Comfort: These cozy socks are made of soft material with a touch of stretch to ensure toe-pleasing comfort. These socks for girls and boys cover the ankle to give a secure fit. 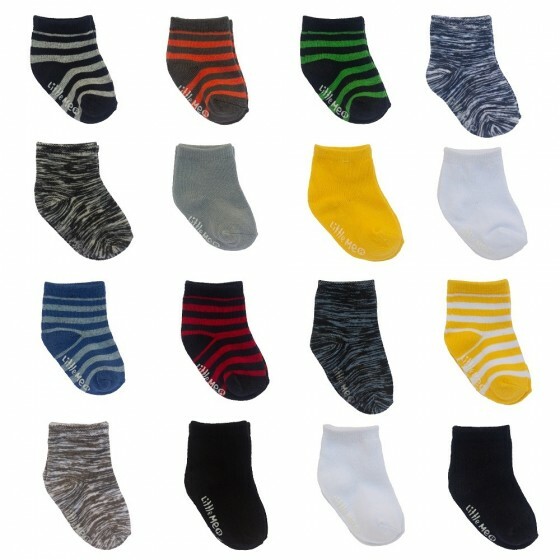 Size & Color Availability: The baby socks pack comes with 16 pairs. Eight pairs are for the ages 0-12 months, and the other eight pairs are for ages 12-24 months. Machine wash cold with like colors. Non-chlorine bleach when needed. Tumble dry low. CHOKING HAZARD- Small Parts. Under 3 years of age must be worn with constant adult supervision.